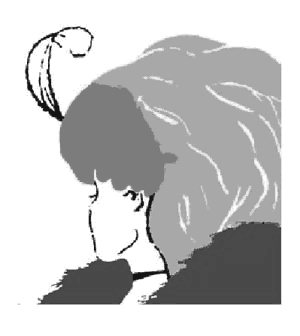 An optical illusion: what do you see? <br>an old lady or a young girl? Something false taken to be true. Usually applied to the difference between being materially identified and spiritually directed. The impermanent or material is considered illusive as it is doomed to change while the management of the form, the spirit resulting from alignment with the soul, and the soul itself is considered eternal as it refers to the invariance of self-awareness and the reality of change, time itself. In these realms of knowledge we speak of either illusion or of truth; in other words, the time order can be false (standard time) or be true (natural time); the law may be false (legal settlement of time) or be true (to the human values and the commandments); the religion may be false (to the linear week order) or be true (directed to the sun and moon); the power may be false (going against the nature of it) or be true (with respecting nature); the intelligence may be false (paradigmatically divided) or be true (syncretically aligned in filognosy); the ego may be false (in identification with the material interest) or be true (as the I of the soul); labor may be false (with an ulterior motive) or be true (voluntary without an ulterior motive); poltics may be false (to the interest of the party) or be true (to the interest of the election group and the order of the election groups); and capital may be false (serving selfhood) or be true (in service of righteousness). Vedically seen is illusion the 'not-this'-awareness (mâyâ). The mantra to curb it: neti, neti or: nor this, nor that. Filognostically we speak also of illusion with the supposition that a single form of logic would be the only form of logic in association with the three basic disciplines of one of the four operative causes of the person, the form, the norm and the doer: the logic then may be true and valid, but is nevertheless a perfect causal illusion because one is not aware of the fact that just as well, with another order of reasoning, another just as valid type of logic may be found. In materialism this type of illusion is common practice.